The foundation course for the sustainability minor SUST 2010 (formerly CU 2010) is open to all majors and is designed to familiarize students with the core values of sustainability. 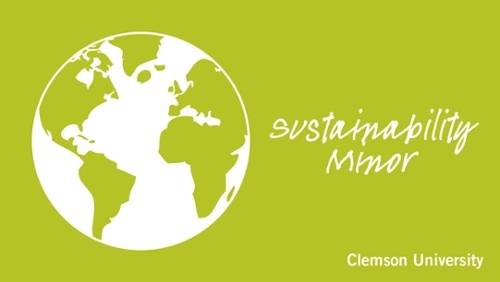 If you are interested in minoring in sustainability, speak with your advisor or contact Jennifer Goree at goree@clemson.edu. For more information, visit clemson.edu/sustainability/academics. To prepare our students to be leaders, innovators and responsible global citizens, Clemson University includes sustainability as an academic emphasis area. Accordingly, the LEAF community provides a residential experience based on the concept of sustainability. Participants, representing Clemson's diverse student body, will learn how principles of economic, social, and environmental sustainability apply in contexts ranging from personal lifestyle choices, to the structure of the built environment, to the operation of public and private institutions. Participants will also develop and practice skills to act as agents of change in the University and the broader community. The following resources provide information about the movement to a sustainable world and how you can start making the change to make a difference. The College Sustainability Report Card: Check out where Clemson falls on the Sustainable Endowments Institute’s 2010 College Sustainability Report Card. The report card provides a grade in each of the following areas: overall, administration, climate change and energy, food and recycling, green building, student involvement, transportation, endowment transparency, investment priorities and shareholder engagement. The Sierra Club — “Eco-Enlightened” College Rankings: The Sierra Magazine reviews and ranks more than 135 college campuses to find the most eco-enlightened schools based on these categories: efficiency, energy, food, academics, purchasing, transportation, waste management and administration. Association for the Advancement of Sustainability in Higher Education: Colleges and universities make up the Association for the Advancement of Sustainability in Higher Education (AASHE). Explore their website to learn more about top campus sustainability news stories, professional development opportunities, interactive resource center and other information. Furman University’s Center for Sustainability: Nearby Furman University is taking the lead in working for sustainability with their David E. Shi Center for Sustainability created in 2008. Visit their website to learn more about how their campus is getting involved and taking action. Millennium Development Goals: In 2000, the United Nations embarked on a new global partnership through the establishment of eight millennium goals: end poverty and hunger, universal education, gender equality, child health, maternal health, combat HIV/AIDS, environmental sustainability and global partnership. Visit this site to monitor progress and learn how you can take action. Clinton Global Initiative: The Clinton Global Initiative brings together people of different backgrounds in order to promote the idea of working together to help solve the most pressing problems in the world. The website includes information about their meetings, membership, commitments, as well as news and multimedia. Greenpeace USA: Greenpeace USA is an activist organization whose main issues are: global warming and energy, oceans, forests, nuclear, toxics and genetic engineering. Visit their website to learn more about these issues and how you can get involved. International Society of Sustainability Professionals: The International Society of Sustainability Professionals (ISSP) is a nonprofit society that allows members to share information and practices. The website includes information about ISSP, discussion forums, upcoming events, publications and an education center that all focus on the issue of sustainability. Natural Resources Defense Council: The National Resources Defense Council is an environmental action organization whose main priorities are: curbing global warming, getting toxic chemicals out of the environment, moving America beyond oil, revising our oceans, saving wildlife and wild places, and helping China go green. ONE Campaign to End Extreme Poverty: The ONE campaign is a nonpartisan grassroots campaign that works to end extreme poverty and preventable disease across the world, with a specific focus on Africa. To learn more about their campaign, policies and issues, check out this website. U.S. Environmental Protection Agency: The Environmental Protection Agency is a U.S. federal agency with the main focus of protecting human health and the environment. World Health Organization: The World Health Organization is a United Nations Organization that is taking the lead on global health matters. Explore this website to learn more about health topics, publications, data and statistics, and programs and projects throughout the world. World Wildlife Fund: The WWF is a global organization with the overall mission of conservation of nature. Visit their website to learn more about the WWF, what they do, the places and species of focus, their science background, the issue of climate and how to act now. Looking for a ‘Green’ Career? Green Careers Guide: The green movement has resulted in new career options. If you are interested in pursuing a career in this rapidly growing sector, check out this website to explore possible careers. Great Green Careers: Jobs for a Greener World: Ready for a green career? Use this website to look at current available job postings and post your resume in order to land your future green career. Earth 911 — Making Every Day Earth Day: Earth 911 is a recycling database that lists recycling locations across the country, as well as provides information and tips on how you can help reduce the impact on Earth. The Story of Stuff: Ever wonder what happens to all the ‘stuff’ you throw away? Check out this video to learn more about production and consumption, as well as its effects on the surrounding environment. Unnatural Causes — Health Equity: Unnatural Causes explores the racial and socioeconomic inequalities in health. By exploring the website you can learn more about the PBS “Unnatural Causes” documentary, learn more about health equity, how to take action against health inequity, and explore media and documents relating to this issue. Unnatural Causes: Health Equity Quiz: Learn more about health equity and put your knowledge to the test. See how much you know about health equity by taking this online quiz.